Nopparat Thara Pier is a great little pier found to the west of Nopparat Thara Beach in Ao Nang. The pier is Ao Nang's main arrival point by boat. 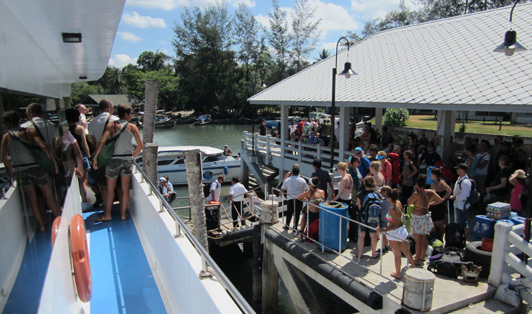 It's relatively small but the pier also acts as the hub for ferries traveling to and from the magnificent surrounding islands and peninsulas. The locals all know the pier well, so just say the name and the local taxis and bus drivers will get you there. Nopparat Thara Beach is on the other side of a little river. 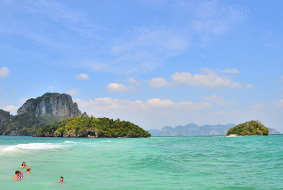 Many Ao Nang citizens love to gather there to enjoy a picnic and a Thai game or two when the sun's not too hot. There's also some awesome little restaurants and food stalls just off the beach. If you have time, go take a look!